We're Woof Pet Resort — a state-of-the-art dog daycare and lodging facility designed with your pup's best interest at heart. Founded in 2015, Woof Pet Resort is a customer-loved, state-of-the-art dog daycare and lodging facility, located in Shrewsbury, Massachusetts. The owners, Jon and Shana Piuze, recognized the need for a facility that allowed pet owners around the state to rest easy knowing that their dog was safe while they were away for work or vacation, and thus — Woof Pet Resort was born. Here at Woof, we take great pride in watching after your dog while you’re away — regardless if it’s for a few hours or a few days. Our team exudes passion in everything they do, ensuring that your pup has a safe, fun, and exciting day at Woof. We're trusted to keep your pup safe. Our team is entrusted by clients all around the state to ensure that your dog is happy, healthy, and safe while you're away for work, vacation, or anything else that your schedule throws at you. 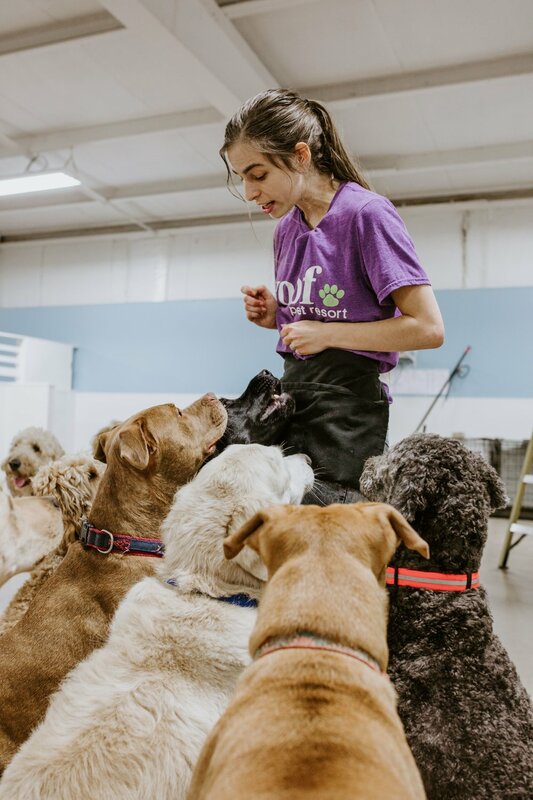 At Woof, you can rest assured that your dog is having the time of their life playing with their friends — all while in a space that's extremely clean and staffed with true professionals that love what they do. From a simple half-day of daycare to multiple days of lodging, we've been entrusted with the care of more than 2100 dogs since our opening in 2014. For the past four years, our team has been staffed solely by people who have one goal — to ensure that your pup has the best day ever at their second home. Woof Pet Resort is more than your dog's favorite place to play and rest while you're away. We're full-service, meaning that we also provide phenomenal in-house services like grooming + training. Here at Woof, your dog will be able to run, play, and interact with other dogs as they please. Our beautiful facility boasts a massive play area of around 6000 square feet, and is staffed by our team who provides love, hugs, and belly rubs — lots of belly rubs. From basic training that teach your dog to sit, stay, and come to advanced sessions like Canine Good Citizen, our resident dog expert, Bob, can train your pooch to be at the top of their game at all times, and can help develop even the rowdiest of dogs. Woof Pet Resort is your pup's home away from home while you're away for work trips, vacation, and everything in between. While you're away, rest assured that your dog is living their best life — playing with friends during the day + relaxing in luxury at night. We know your schedule is only getting busier each day. That's why we built Woof to be a one-stop shop for all your dog needs. Drop your dog off for a day of play and grooming, or simply schedule an appointment to meet with the best grooming team around. We absolutely love it here. They care so much about our dog and they're always excited to see him. The people that work here always exude a love of their jobs. Our team is staffed with a variety of additional, highly trained personnel that can handle an assortment of tasks. From a full grooming session to basic training, we’ve got your pup covered. Becoming a customer is easy! Our 3-step onboarding process outlined below officially makes you a customer in our system, allowing you to schedule daycare sessions, request lodging when you're going out of town, buy packages, and much more. Creating an account is simple, quick, and allows you to manage everything about your dog — entirely from your phone. You can sign your agreements digitally from your phone, tablet, or computer, saving you time + energy. We want to know about your dog! In this final step, you'll tell us about your pup — name, age, breed, and more.